F2Pool has partnered with some of the major exchanges to support the withdrawal of Grin revenue. You can use the wallet node URL or bind your account information on the exchange to withdraw GRIN coins. Note: UID is your ID number on the exchange, the only identification information. If you are unsure of your UID information, please communicate with the exchange. Note：If using Grin wallet address to receive mining revenues，please do select the “wallet address”，when you choose the address type you deposit Grin. 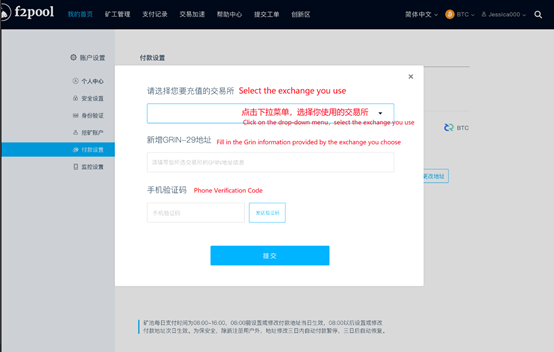 6,Select the exchange you use as demonstrated in the picture below; Fill in the withdrawal information of the Grin provided by your exchange (email account, UID or URL and other specific information, which are subject to the rules of the exchange); fill in the SMS verification code sent to you by the pool; click “Submit”. Please fill your grin address info seriously，according to the guide of the textbox. 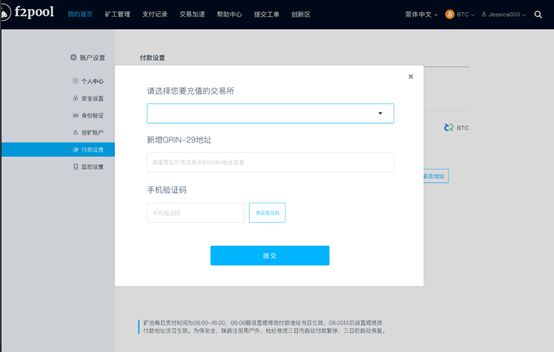 If using Grin wallet address to receive mining revenues，please do select the “wallet address”，when you choose the address type you deposit Grin. Grin withdrawal through F2Pool is now available!